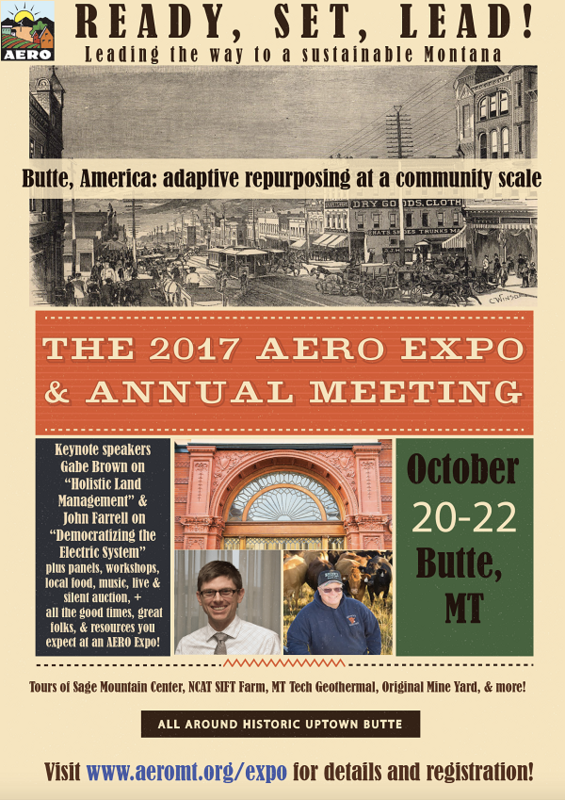 Alternative Energy Resources Organization’s (AERO) 2017 Expo & Annual Meeting will meet in the heart of Uptown Butte, October 20-22. The Expo will include breakout sessions, meeting spaces, and an auction/dance among a series of original buildings within walking distance of each other. As part of this Expo, Sage Mountain Center will give a tour of their sustainable off-grid food systems in a rural and urban environment on Friday, October 20 from 10-11:15am. Elements of the tour include: Straw bale and Cordwood construction, solar and wind battery storage, composting toilets, rainwater harvesting, year-round Permaculture food sourcing, and more. Chris Borton, co-founder of Sage Mountain Center and member of AERO, will give a solar power-directed workshop, one of a dozen sustainability-themed skill and resource sharing sessions on the agenda. Borton’s workshop, “Energy 201: PV 4 U,” will provide participants with the knowledge they need to put solar panels on their home or business.He will address compatibility issues for solar and different types of homes. 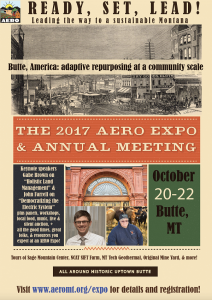 For more information or to register, please visit AERO’s website.